The Daily Coffee Group is a fast-growing and truly South African coffee franchise group. Coffee is our business and we have two tailor-made franchise models – The Daily Coffee Café and The Daily Coffee Express – from which franchisees can choose to give their customers what The Daily Coffee Group has become renowned for – good coffee and a warm emotion! We offer franchisees more than mere franchise opportunities. We present a premium investment platform to become part of South Africa’s lucrative and fast-growing coffee industry – an industry where a modern way of life and a growing number of coffee enthusiasts create an increasing demand for good coffee and branded lifestyle coffee destinations. 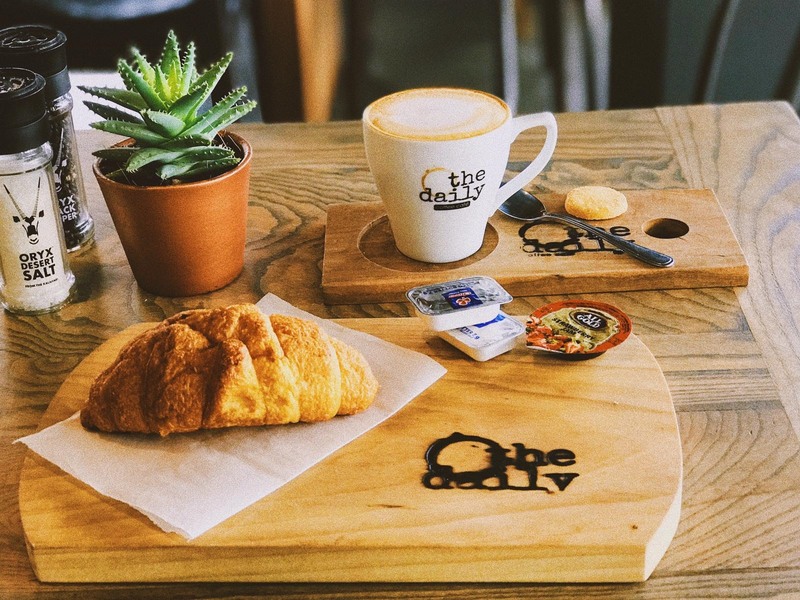 Founded in 2013 when the first The Daily Coffee Café opened and officially expanding into a franchise group in October 2015, The Daily Coffee Group is already recognized as an industry leader with our popular coffee cafés and other coffee outlets renowned for their high standards in service, coffee, food and décor. Inspired by the café life so prevalent from Cape Town to New York, we pride ourselves on our professionally made five-senses espresso coffee and associated drinks. At the same time our seasonal fresh and newly-prepared food and baked items, together with service based on genuine hospitality, create even more reason to frequent these trendy destinations. Enter any of our coffee cafés, and the modern and striking, yet subtle interior, together with its hassle-free atmosphere will uplift, relax and prepare you for a refined experience. Key to this is the pleasing and much talked about New-York-meets-Karoo theme which takes our patrons on a visual journey where they can expect to come across hints of upmarket Big Apple urbanism, combined with shades of customary down-to-earth South African appeal. Our community-based coffee cafés have become destinations of choice where the staff is friendly and real, making it their task to make customers feel at home in this great place and space, whether meeting with a friend or two, or simply to enjoy quality me-time on their own. The Daily Coffee Group’s future growth is based on a carefully conceptualized and managed strategy. It is furthermore driven by our passion for people and an underlying desire to offer The Daily Coffee experience to more and more clientele to come home to our good coffee and inviting atmosphere. The Daily Coffee Group’s business is coffee and as such we are driven by our love for coffee, our passion for people and an underlying desire to expand our franchise network so that more and more coffee lovers can come home to our good coffee and get hooked by our warm emotion. We seek to grow our brand and to be recognized as the preferred and trusted coffee franchisor that offers its franchisees the best support and a proprietary business package renowned for its high standards in coffee, food, décor and service. The Daily Coffee Roastery – a division of The Daily Coffee Group – is the supplier of freshly-roasted coffee beans to The Daily Coffee Group’s franchises. This roastery, aptly located in South Africa’s tradition-rich Boland region, is a creative space where the know-how, dedication and zeal of our roasters go hand in hand with modern-day roasting precision, together with the unwavering traditional values of the art of coffee roasting. Our hand-roasting process that is linked to automated roast profiles, maintains roast consistency and uncompromising quality in each batch of coffee beans that we produce, yet with the coffee roasters’ personal perfection that only the hand-roasting process allows. The strong emphasis that we place on the quality and taste of our coffee beans ensures that each cup of coffee that our coffee cafés serve is crafted to perfection. We source the finest coffee beans from coffee producing regions in Africa. And although the New-York-meets-Karoo décor theme of our coffee cafés says something of the international inspiration behind our coffee franchises, the African origin of our coffee beans confirms where our roots are – right here in Africa! As with everything else that we do, the items and preparation of the food on The Daily Coffee Café’s menu contribute to that overall experience of gratification that frequenting our cafés offer. Being constantly aware of our clientele’s dietary needs enables us to carefully compile our menu so that it is not overwhelming, yet offering everything that the discerning guest may require. We cater for breakfast, brunch and lunch, and in particular for craving-for-delectable-delight moments with our superior cakes and confectionery. We make seasonal adjustments to our menu four times a year so that we are able to offer only the freshest of what is available at any given time.